Kenneth Ian Ross Kirk was born in Lithgow 19/11/1946 and grew up living in Mt. Wilson. He is the youngest of three, elder sisters Jill and Robyn. He has grown up with wood chopping all his life due to his father Tom Kirk being one of the best World Champion Axemen in history. Ken started chopping when he was 10 years old. Ken is married to Margaret and have3 sons Steven, Troy and Andrew, who all had many successful years competing but only Steven and his 2 sons Mitch and Tommy still compete today. 13’’ Underhand Australian Championship Newcastle show 1971. Many state titles both Underhand and standing block, and sawing events and numerous local championships. Double handed sawing Australian and state titles with Mick Beckett, and placed 3rd and 4th in the world title double sawing at Sydney show with Gary Smith and son Steven Kirk. Represented the New South Wales team at the Sydney Royal Show on many occasions and the last time in Christchurch show NZ. Won the big 13’’ $5000 Standing block hcp at Wangaratta Velodrome. Cut the Underhand in the big medley relay at the old Sydney show where their team set the record which still stands today and is listed in the records in the Easter show programme. 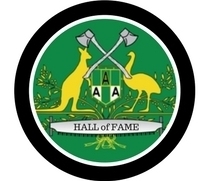 Ken’s involvement in woodchopping also included being Vice President and President of the NSW Axemen’s Association, also the Secretary and Handicapper for the Central Coast Axemen’s Association for over 12 years. After over 53 years of involvement in the great sport of Wood chopping he stopped competing due to ill health at the age of 63, but still enjoys hearing the results of the current competitions.